Microsoft Lumia 650 press shot appears; unveiling delayed until the middle of this month? We've showed you various images of the unannounced Microsoft Lumia 650 over the last couple of months, but today we can pass along the best look yet of the handset. Thanks to a tweet disseminated by Evan Blass (you probably know him by his Twitter handle of @evleaks), we have what appears to be a press shot of the phone. We also have a run-down of the latest rumored specs for the device, starting with the 5-inch display. The screen will carry a 720 x 1280 HD resolution, and under the hood will be the Snapdragon 210 or Snapdragon 212 SoC. 1GB of RAM is inside, along with 8GB of expandable native storage. There is a rear-facing 8MP camera, and a 2000mAh battery keeps the generator humming. The Lumia 650 will support 4G LTE connectivity, and will come with the Lumia Glance Screen. MobileFun U.K. allows you to reserve the unit even before it becomes official. The price works out to the equivalent of $284 USD. The phone is offered in Black and White, and there is some speculation that Microsoft will try to sell the Lumia 650 to the enterprise as an affordable handset for employees. By the way, this model comes with Windows 10 Mobile pre-installed. Originally expected to be announced this week, a software issue has reportedly pushed back the unveiling until the middle of this month. 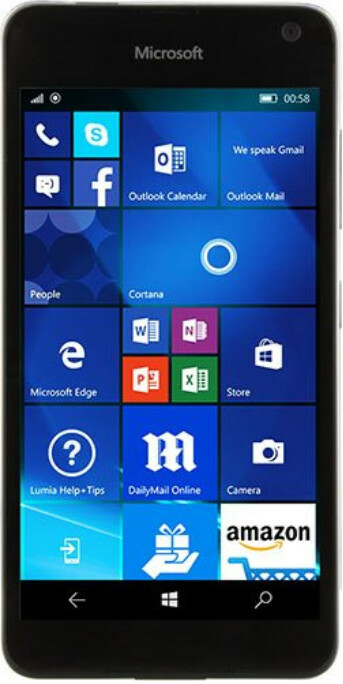 Perhaps Microsoft will decide to wait until the third week of February, when MWC 2016 opens in Barcelona, to make the Lumia 650 official. And yes, this could be the very last Lumia model as Microsoft is rumored to be prepping the Surface Phone. Yet another nail in Windows Phone coffin... Hehehehehe Yet anothe WP handset who will FAIL. I'd say that the specs are fine, as the 650 looks like a refresh of the 640 - a phone that did a good job for me before the 950 XL was available. I'd expect that the phone will be available at a much cheaper price. The larger question in my mind is whether Microsoft will be successful at taking the hands off approach that they are pursuing now. Like it or not, phones seem to be judged by how many sell. Selling phones in large numbers tends to require deals, advertising, and conveying a belief that the phone is strongly supported - that there is a solid, public commitment to drive the platform towards an exciting future. I'm not seeing much of this. Just hope the official statement says snapdragon 410, then it would become a great bargain. Why go back to the Snapdragon 212 after the Lumia 640 used the Snapdragon 400? From what the whitepapers show not much difference and probably cheaper. I would like to see benchmarks first though. Yes but this phone is the update of the Lumia 640, meaning it should have equal or better specs, not downgrading the chipset even if there isn't much of a difference. Plus if it costs $284, it will compete with the OnePlus X, the upcoming Alcatel OneTouch Idol 4/4S and other midrange phones which blow out of the water the Lumia 650. No worry, ms fans like elitewolverine will buy it.